Maziyar "Maz" Jobrani is an Iranian-American comedian who was part of the "Axis of Evil" Comedy Tour, which featured some of the top Middle Eastern-American comics in the world. The Axis of Evil Comedy Central Special premiered in 2007 as the first all Middle Eastern show on American TV. The DVD was also released in 2007. 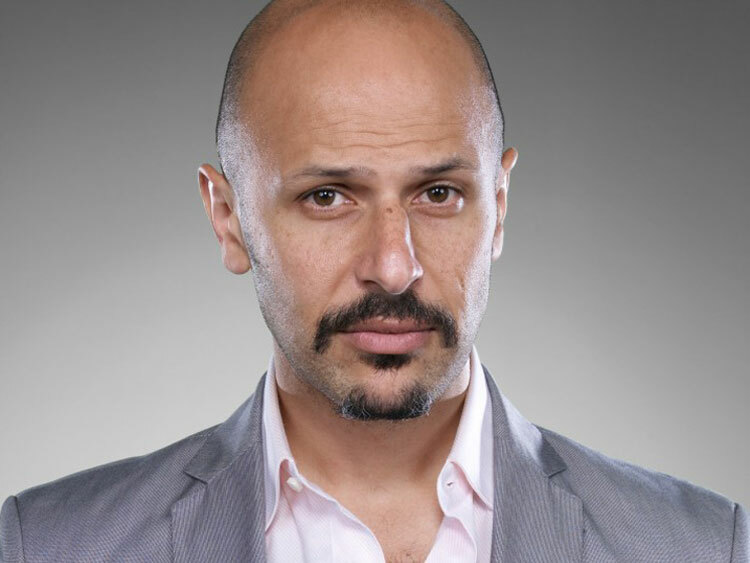 Maz Jobrani has played many characters in flim and televison. Most recently, he played Gourishankar P.V. Subramamiam, an Indian lawyer turned NY cab driver who took part in the plot to rob Mick Jagger in the ABC sitcom "Knights of Prosperity." Prior to that he was best known for his big screen role as "Moly" in Ice Cube's "Friday After Next." He also played Secret Service Agent "Mo" in the Sydney Pollack thriller "The Interpreter," opposite Sean Penn and Nicole Kidman as well as Jennifer Garner's colleague, Glenn, in "13 Going on 30." Additional film credits include the critically acclaimed "Maryam," touted by Roger Ebert as one of the most overlooked films in 2000, the Kevin Costner drama "Dragonfly," and independent films "Season of Madness," "Something Borrowed", "Moonpie" and "Bug." Television audiences may recognize Jobrani from his role as Mr. Hut, the angry owner of a fast food stand in the town's mall on the Fox sitcom "Life on a Stick." He also appeared in recurring roles on "24" (Season Two), "Life with Bonnie" and "Cedric the Entertainer Presents." His numerous guest appearances include both popular comedy and dramatic series such as "Malcolm in the Middle," "Still Standing," "The West Wing," "NYPD Blue," "Without a Trace," "ER," "Law and Order," and a memorable turn as "The Sikh" in the hilarious 2004 season finale of "Curb Your Enthusiasm." He has done standup on "The Tonight Show with Jay Leno," "The Late Late Show with Craig Ferguson," "The Late Late Show with Craig Kilborn," Comedy Central's "Premium Blend," and England's Paramount 2 Network. He also performs standup at The Comedy Store and The Laugh Factory on LA's famous Sunset Strip as well as many top clubs in New York, including The Comedy Cellar. His routine has been featured on CNN, CBS, PBS, and NPR; as well as being highlighted in Time Magazine, Newsweek, The New York Times, The LA Times and The Wall Street Journal. His sketch comedy performances at the ACME Theater in Los Angeles were hailed as "devilishly funny" and "extraordinary" by LA Weekly. Jobrani was raised in the San Francisco Bay Area, where he caught the acting bug after portraying the lead in his eighth grade production of "Li'l Abner." He studied theater throughout high school, then went on to earn a BA in Political Science and Italian at UC Berkeley. In the fall of 1994, while beginning a Ph.D. program in Political Science at UCLA, he visited the university's prestigious theater program and was immediately hooked back on acting. This led to him dropping out of the Ph.D. program to pursue his childhood passion. Jobrani makes jokes about racism, mainly racism against Iranians and Arabs, but also makes a lighter note that they are not perfect, stating some of the flaws. His jokes tend to brighten up the stereotypical view of Middle Easterners.